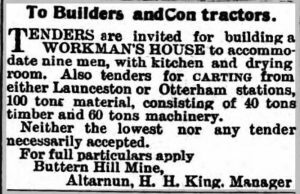 Mining in the Launceston area | Launceston Then! 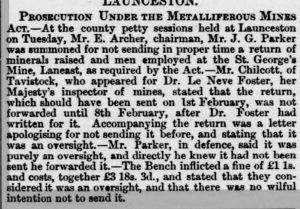 From the late 18th century and through the 19th century, many mining schemes were started around Launceston, the most popular being the manganese mine at Lidcott, Laneast. 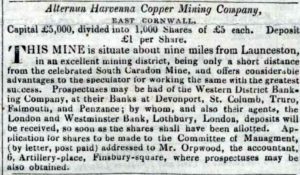 Other notable mines were the Inney Consuls just above Two Bridges in the South Petherwin parish (also known as the Two Bridges Mining Company) and just across the valley, the Trevell Silver Lead mine, in Lewannick parish. 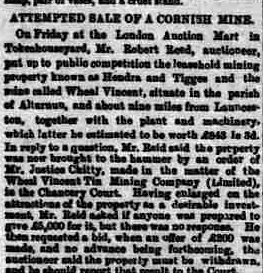 Down near the River Tamar there were the Greystone silver lead, Wheal Sophia, and North Tamar (started in 1839 and closed in 1857) mines which were to later form together and become Greystone Quarry. 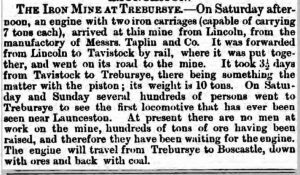 Over at Trewen by the Inney again we had the Trenault mine and limestone quarry and near Truscott there was another manganese mine as well as another mine at Trebursye the opposite side of the Kensey Valley. Other mine workings in the area include Tredarrup, Treburtle and Trebullett. 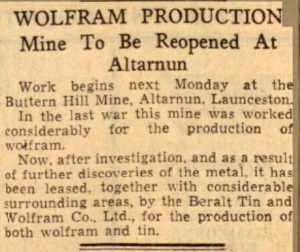 However, Altarnun proved to hold the most resources to be mined with mines scattered throughout the area. 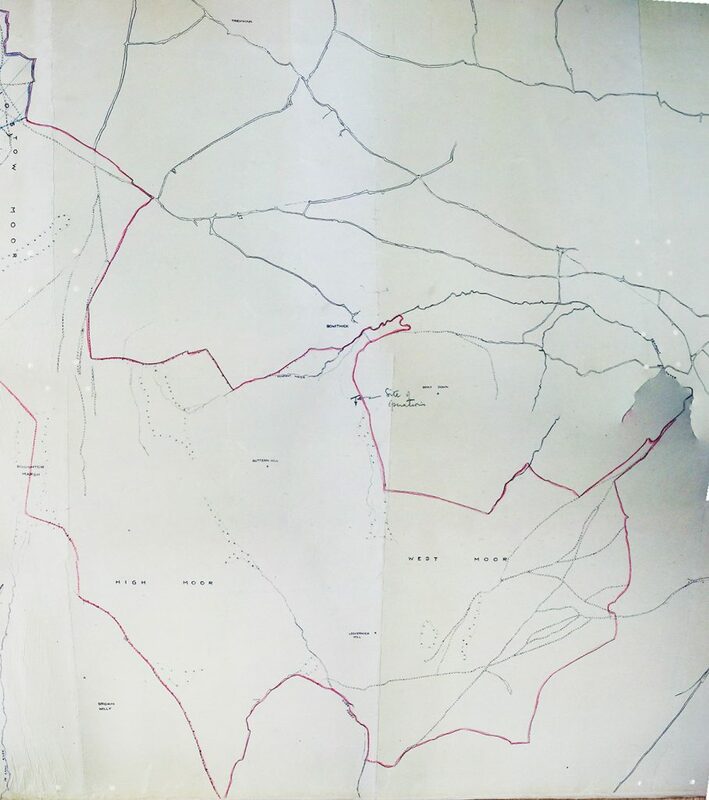 New Horse-borough (below left and right), Trewint United, Trezelland, Wheal Bray (closed in 1858) and Wheal Vincent (opened around 1871, closed in 1890 re-opened in 1900), were but a few and long after the mines in the other areas had ceased working and closed down, the mining of the Altarnun area continued apace. 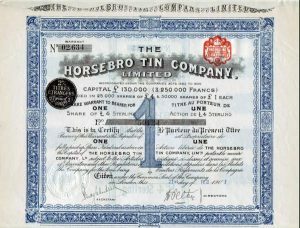 This interest was short lived and most of the mines eventually closed by the beginning of the First World War. 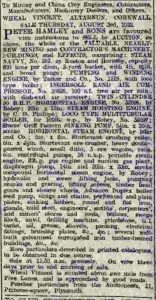 However, one, Wheal Vincent, became a valuable prospect for the war effort in that it held copious amount of wolfram. This wolfram, also known as tungsten, was invaluable as it was used in making steel and the tungsten alloys have also been used in cannon shells, grenades and missiles, to create supersonic shrapnel. 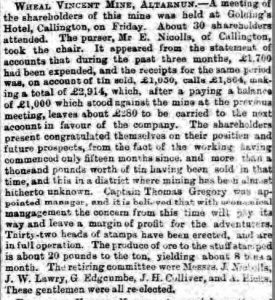 The mine had struggled like all the others before the war, and even with an injection of £7,000, the syndicate leasing it, had to hand it back, whereby it was taken over by the Government in 1915. 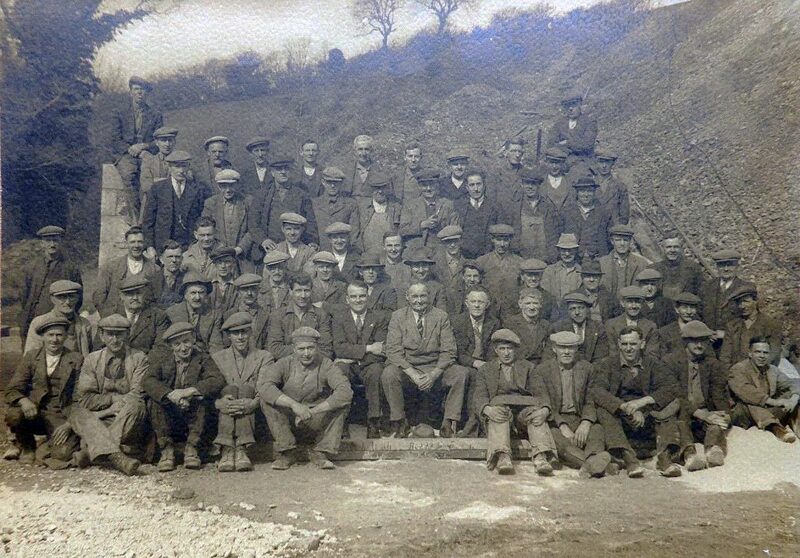 By 1917 the mine was employing up to 40 men. 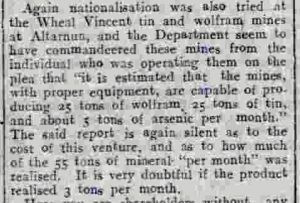 However, some doubt was raised on how productive Wheal Vincent actually was with an accusation that it produced little of the reported monthly 55 tons of mineral, stating that barely 3 tons would have been the more likely figure. But with the war over and having the backing from the Government removed, the mine finally closed in 1919, with all the equipment being sold at auction in the August of 1922. 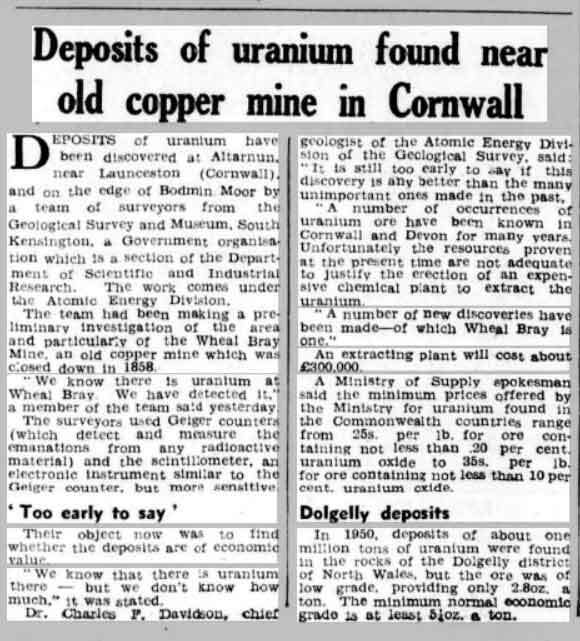 The last actual working mine was Altarnun’s Wolfram mine seen above being worked in 1938 and this closed in 1957, although in 1953 small deposits of uranium were found near the old Wheal Bray Mine, but being so small it was deemed uneconomical to mine. 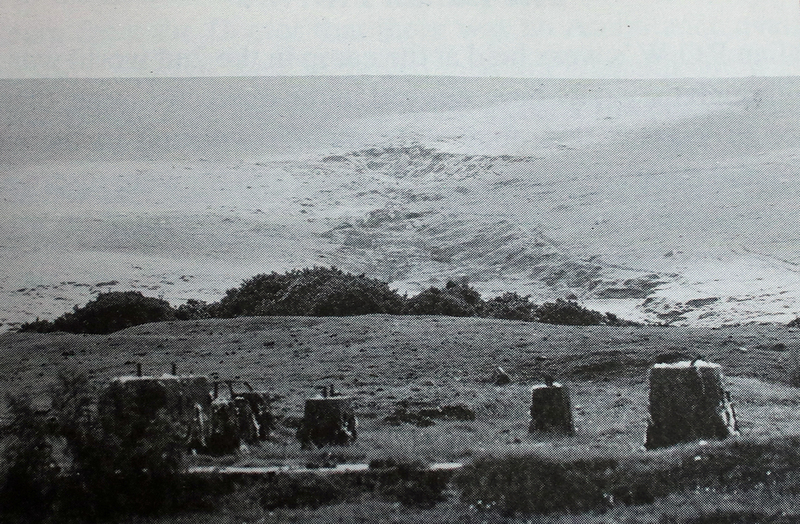 Buttern Hill was an open cast mine on Bodmin Moor near Bowithick. 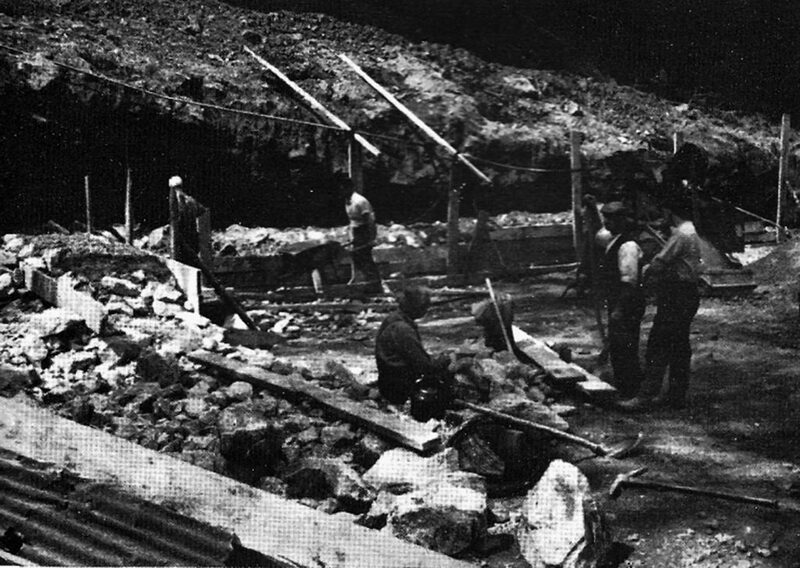 Wolfram and tin ores were extracted from the mine. A pump driven by a steam engine, delivered through canvas pipes to the mine for panning and washing. A dam was built for this at the edge of the Kenniton Marsh. To gain access to the mine, two well constructed bridges were built over the small stream from the ford at Bowithick. 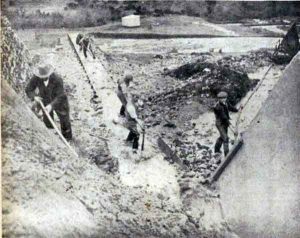 The washed clean gravel became a useful material for making concrete to construct (the Blowing House) the early form of tin smelting house. The end product from this building was known as ‘grain tin.’ Furnace temperatures for the Blowing House was raised by bellows, although in most cases operated by water wheel, a circular area around which a shaft was turned, suggest horses were also used. The fuel used was charcoal, demanding large quantities of wood. Large steam engine and crusher bases and conveyor systems supports still remain today. Some of the granite stone walls were still standing up to the 1960’s, but have since fallen away. After the wolfram and tin ores were graded out, hundreds of tons of stone was supplied for road materials. 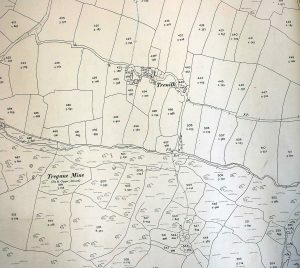 During both the 1st and 2nd World Wars the mine was worked by German Prisoners of War, with the nearby farm of Bowithick being the site of the P.O.W. Camp. Buttern Hill open mine site. 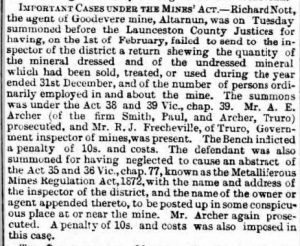 Great Tregune Mine, Altarnun (Tin and Copper mine operated around the early 1850’s until being wound up in 1865) Found west of Trenilk. 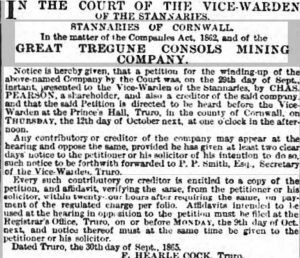 At Great Tregune Consols Mining Company meeting, on Thursday, the accounts showed a balance at bankers, 170 Z. 12s. lOd. In total 31 tons of Copper Ore and 31/4 of Copper were raised. 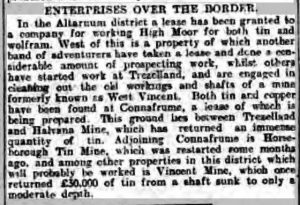 This mine lay just west of Wheal Vincent near Cannaframe. Having been worked in the late 19th century, it was re-opened in 1907. 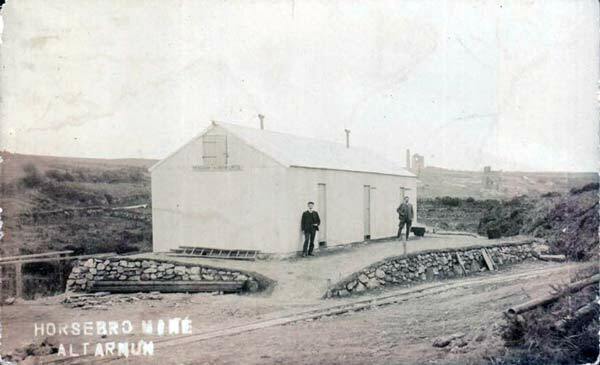 New Phoenix Mine, Altarnun (manganese mine closed in 1894) Produced 470 tons of manganese ore between 1887 and 1890. The old workings, which are of very small extent and shallow, are situated on the south side of the river Lynher about midway between the ruined corn mill of Trevague and Treburland home- stead in the parish of Altarnun. 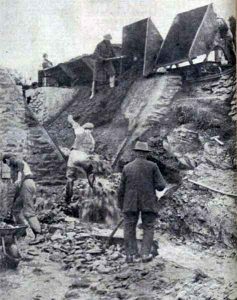 At what date the deposit was discovered it is not known, but between the years 1887 and 1890 the mine produced 470 tons of manganese ore (pyrolusite) and was then worked in conjunction with the adjoining Treburland tin and wolfram mine and by the same adventurers. 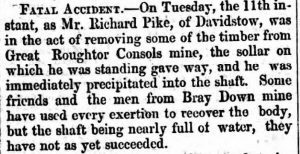 The name New Phoenix was given to the joint concern by the manager, Captain Vercoe, in consequence of the flippant and uncomplimentary name, Wheal Flop, by which the tin mine was known to the miners. Close to the manganese workings are the ruins of a tin-stamping mill and in the walls of this are built blocks of rhodonite. The appearance of this mill suggests that it is of some antiquity and the water-wheel which drove it was fed with water by a leat, an underground portion of which appears to have traversed the manganese deposit; hence this may very well have been discovered during the construction of this watercourse. Most if not all of the dump material appears to have been raised during the 1887-1890 working. 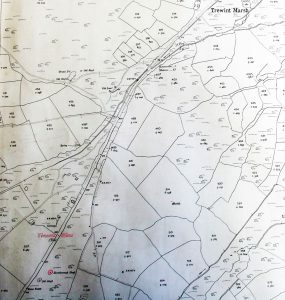 Some 120 yards to the south there is situated the old Treburland tin and wolfram mine, alias Wheal Annie or Wheal Flop, which worked on true lodes traversing both granite and killas, and a part of which was again worked in 1942. An ENE. lode worked near the granite margin and followed into the killas. The lode had also been tested along the hill top to the southwest, but was poor. 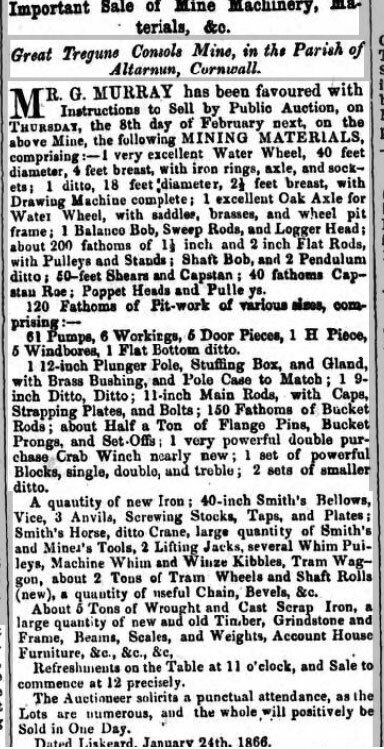 In 1857 and 1858 508 tons of copper ore were raised and 15 tons of copper. The veinstone was porous quartz. White mundic occurred in great quantity and the tip was being carted away to form garden paths, as it was poisonous to weeds. Wheal Vincent Mine, Altarnun. 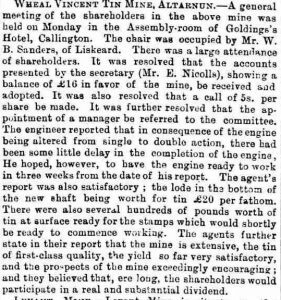 Between 1872 and 1881 the mine produced 62 tons of black tin. 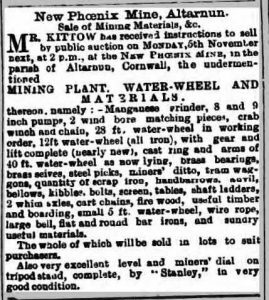 This small mine was situated four miles south-east of Launceston in the parish of Lezant and was worked from 1877 to 1880, when it produced about 150 tons of manganese ore (pyrolusite) valued at £150 It was reopened for a short time in 1907 when a little exploratory work was done, but no ore raised. Larrick Ochre Mine The oxide of iron which gave rise to the ochre was formed by the decomposition of lava, in which several pits were sunk with the view of testing its extent and quality. The material was treated in a shed near Trecarrell Corn Mill. Very little was worked. North Wheal Tamar or Greystone silver-lead mine. ATTELDOUNE, Atledown, ATTEWELL, Attway, ATTELL, Attle, ATTEWODE, Attwood, ATTEWEY, Attway. Attle is a Cornish term for old mine workings or waste rock of no value, which indicates that the land in this area of the Kensey Valley had been worked in ancient times. 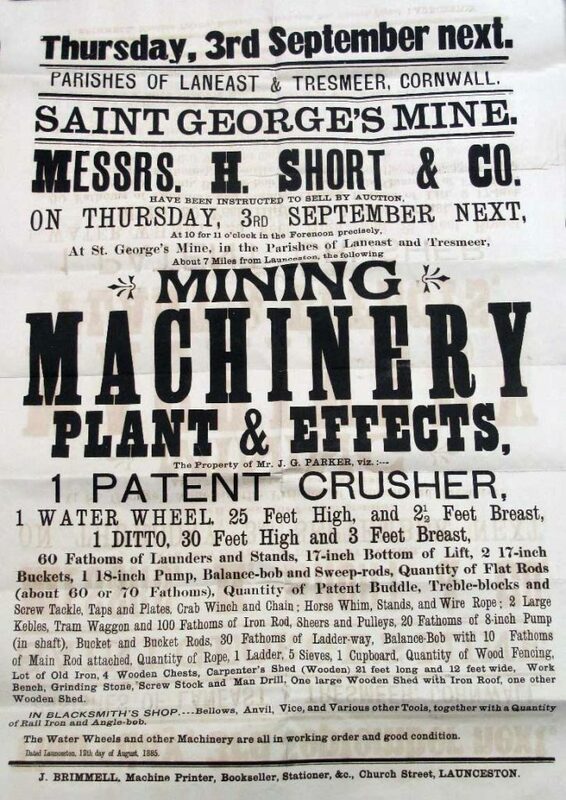 Trebursye Mine (Iron ore opened around the late 1850’s)From 1862, a stream-powered traction engine was used to bring manganese ore 3 times a week from the Trebursye mine near Launceston to the manganese mill in Boscastle, and return with coal from the harbour. Taken from the excellent ‘History of Boscastle and Trevalga’ by Francis Allen Burnard and edited by Andrew Ross M.A. 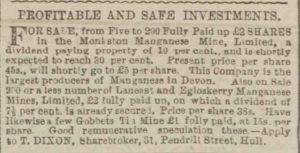 Manganese, in the form of pyrolusite, was extensively worked close to the hamlet of Higher Truscott in the early part of the 19 century, and in more recent times returns of manganese ore from here are given under the heading of St. Stephens by Launceston. 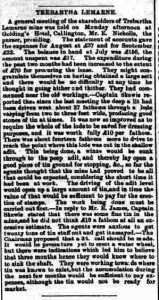 Thomas Spargo reports in 1865 that an adit was being driven to cut the lode, which looked well; in 1868 he mentions the adit being 20 fathoms deep, but the mine abandoned. The last working seems to have been in 1876-1877 when the official returns are given as 540 tons of brown haematite, of which 400 tons contained 15~ of manganese. This so-called brown haematite was probably magnetite. 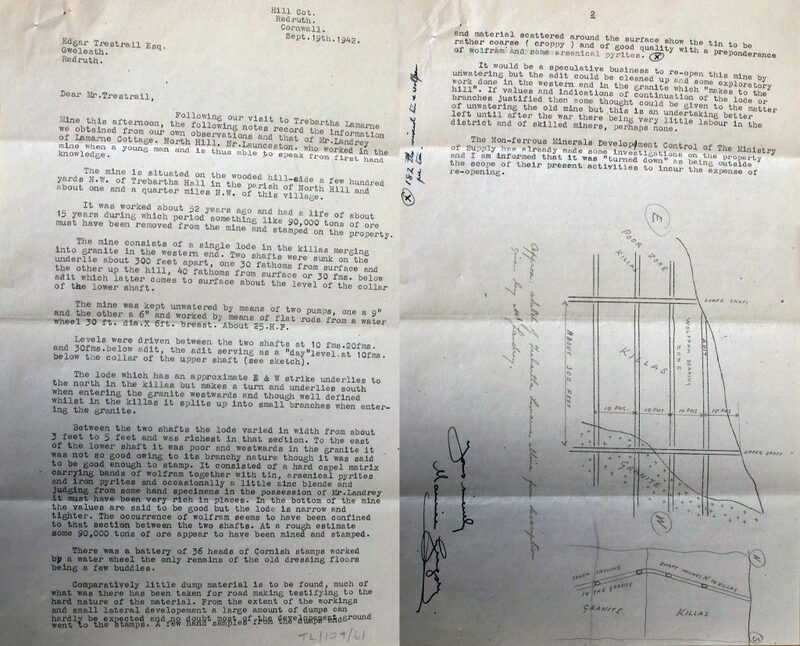 Very little evidence now remains to indicate the site of the former operations, which lied directly north-east of Higher Truscott hamlet and between it and the north end of Cannapark Wood. Farther north-east in the north end of Cannapark Wood there are remains of old workings or rather dumps which contain magnetite with pyrite and some pyrolusite evidently from a bedded deposit. 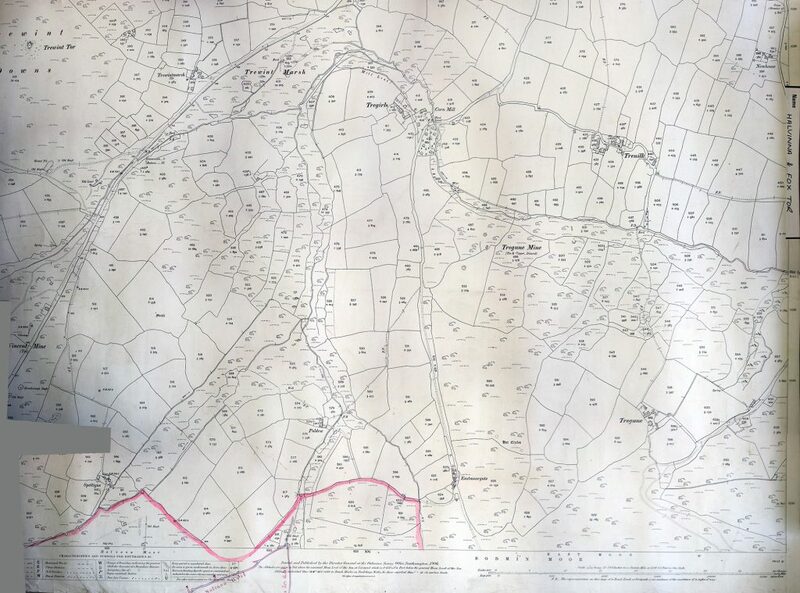 At 600 yards to the south and close to the old railway line, there is a large quarry-like excavation which is marked on the six-inch map as Higher Truscott mine. No manganese is to be seen here and the working suggests that it was limestone which was quarried. Though no longer visible, there is some evidence of an adit-level having been driven from this excavation north, either to the manganese workings or to Cannapark limestone quarry. Half a mile north of Higher Truscott and directly adjoining Langore hamlet on the south there are some old completely overgrown manganese workings with an adit-level leading up to them from the stream to the west. lode about ten fathoms from the surface. 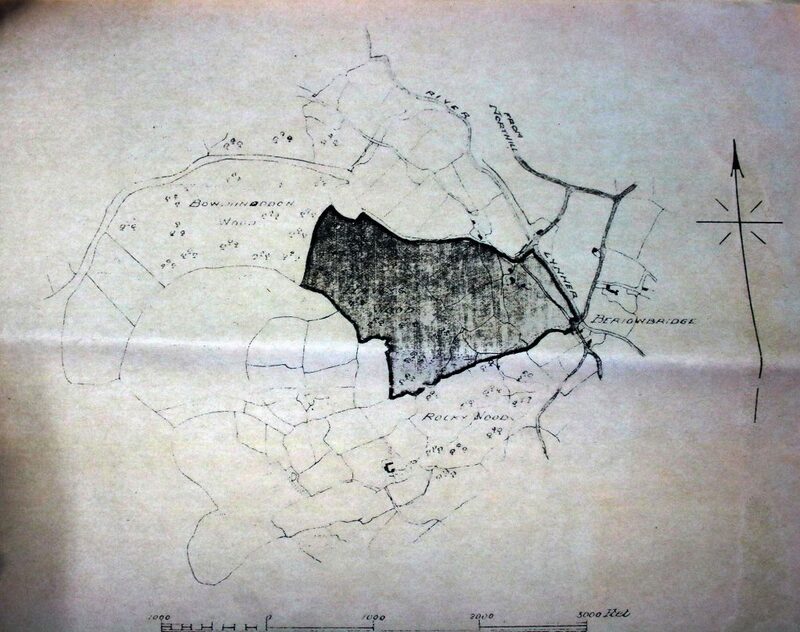 A manganese mine (c.1815) along with two limestone quarries. Berriow Consols Mine (1853-1860) Copper Mine. Great Rodd Mixed Mine This mine along with Wheal Rodd is situated just above Bathpool. Hawkswood Wolfram Mine in the 1950’s. 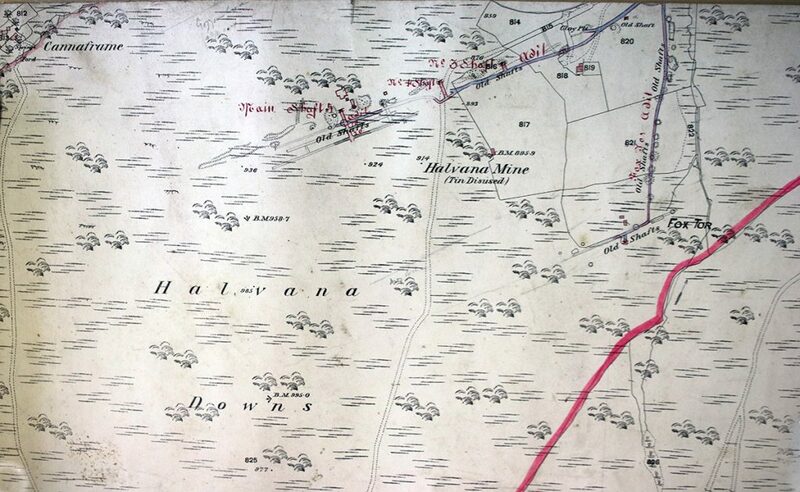 Hawkswood Mine Map from the 1950’s. 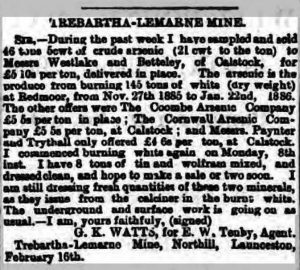 Trebartha Lemarne Mine (1881-1888) produced a total of 20 tons of Black Tin as well as 18 tons of iron pyrites, 201 tons of crude and refined arsenic. 14 tons of tungstate of soda sold for £24 a tone. 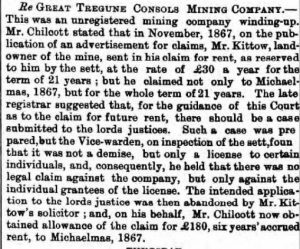 The mine was converted into a Limited Liability Company in September 1885. 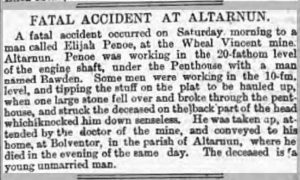 The mine was officially liquidated in September 1893. 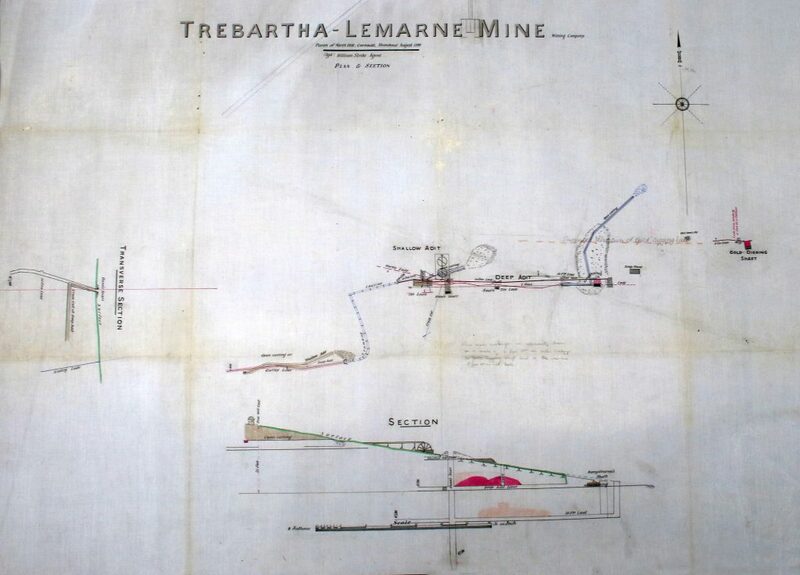 “Trebartha-Lemarne Tin Mine is situate on the Trebartha Estate very near to the mansion of F. R. Rodd Esq. and is worked at present by water power, and very recently a large outlay has been made in erecting works for separating tin, arsenic and other minerals. It has been worked by a local company for 7 years, Mr J. B. James of Plymouth is the Purser, and Capt H. Bennett of Redmoor [is] the Manager. The mine has a remarkable ancient history.” Venning’s Postal Directory of 1901. Wheal Luskey was a copper mine opened in 1881 and which looked promising at first but was abandoned in 1886. It lies across the River Lynher due west of Trebartha Village just below West Castick. projects well above the ground and is visible at a great distance from the north ; it is known as Lanlavery Rock. The mine actually worked is situated on the west side of the marsh at Old Park, but shafts were also sunk on the east of the marsh and close to the farm, but no ore appears to have been raised. Further trials were made on the vein, on both sides of Lanlavery Rock, but little ore was met with. The great reef formed apparently by the same vein on the west of the granite, about the Devil’s Jump, does not appear to have been tried ; but so much of it stands out bare and clear of the ground that its barren nature is quite obvious. The veinstone met with here is of the porous type of quartz associated with pyrites. 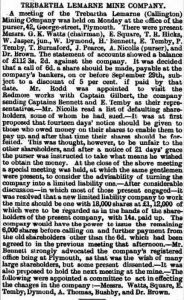 At Inney Consols meeting the accounts showed balance against adventurers of 22/. 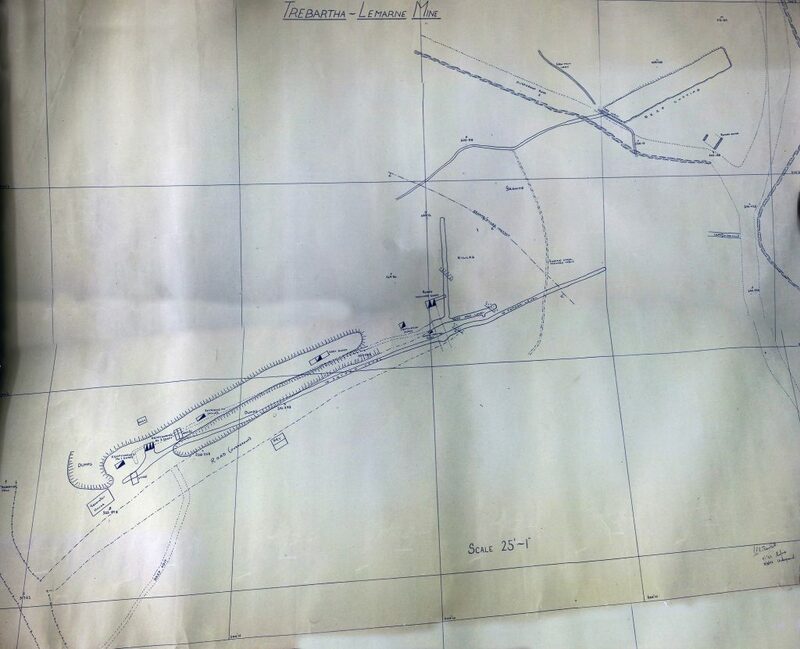 This mine is situated on the north-east edge of Laneast Downs, 360 yards south-east of Lidcott farm in the parish of Laneast. 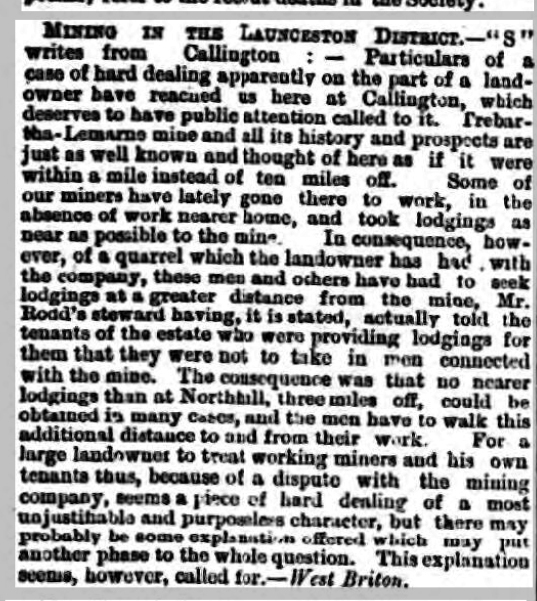 It had been at work for many years prior to 1826, in which year it was taken over by the Lidcott Manganese Company. The earliest working consisted of a large cavern-like excavation with many ramifications, open to the day, and which is still accessible and well exhibits the nature of the deposit. Later it was worked by shafts, of which there are several, communicating with an atilt-level opening from the stream bottom to the north-east. The mine was last worked between the years 1875 and 1881 in conjunction with Westdownend farther to the north-east.